Today, the League of American Bicyclists recognized Provo Bicycle Collective with a Gold Bicycle Friendly BusinessSM (BFBSM) award, joining nearly 1,400 visionary businesses across the country. With the announcement of 60 new and renewing BFBs today, Provo Bicycle Collective joins a cutting-edge group of 1,367 local businesses, government agencies, and Fortune 500 companies in all 50 states and Washington, DC, that are transforming the American workplace. Encouraging employees to ride their bikes to work has boosted productivity by ensuring that each staff member arrives fully awake, energized, and ready for the day. 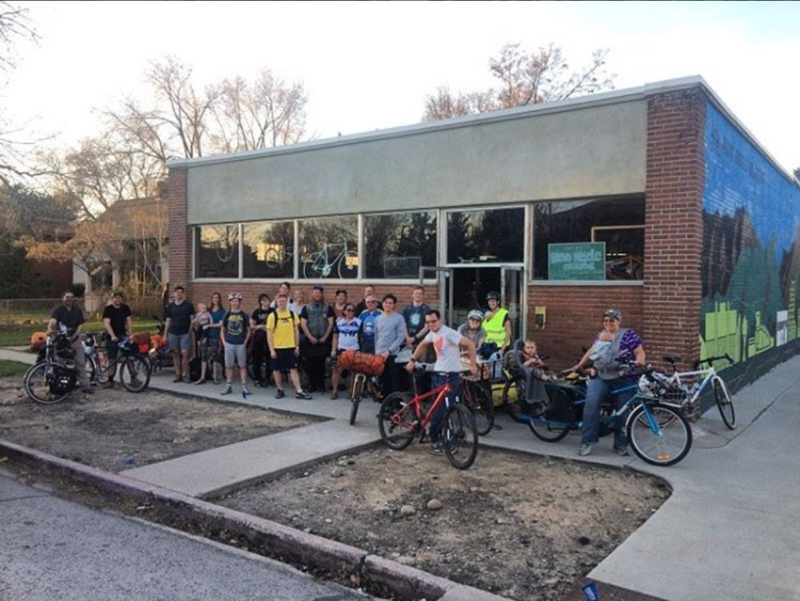 Provo Bicycle Collective encourages bicycling as an easy option for transportation and provides amenities such as indoor bike parking and incentives such as access to employee pricing on bike goods for employees. 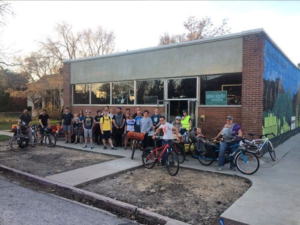 Moving forward, Provo Bicycle Collective will have access to a variety of tools and technical assistance from the League to become even more bicycle-friendly. When our employees bike, great things happen: the need for onsite parking decreases, productivity increases, and our carbon footprint greatly decreases. To learn more about building a Bicycle Friendly America, including the Bicycle Friendly CommunitySM, Bicycle Friendly StateSM, Bicycle Friendly Business, and Bicycle Friendly UniversitySM programs.visit www.bikeleague.org/BFA. The League of American Bicyclists is leading the movement to create a Bicycle Friendly America for everyone. As leaders, our commitment is to listen and learn, define standards and share best practices to engage diverse communities and build a powerful, unified voice for change. People who bicycle are praising the new bike lanes on 500 West, which were installed early this month. The lanes run from 300 South to the new Lakeview Parkway (road and more importantly, trail), a distance of 1.6 miles. They provide folks in the southwest neighborhoods a safe route into central Provo (though not quite to downtown) for the first time. Going the other direction, they give recreational riders, including families out for a spin, access to the trail that opens up stunning views of the mountain, lake, marsh and farmland as heads west to the airport. They also connect bicyclists to East Bay workplaces via the trail in the opposite (easterly) direction and the bridge over 1-15. 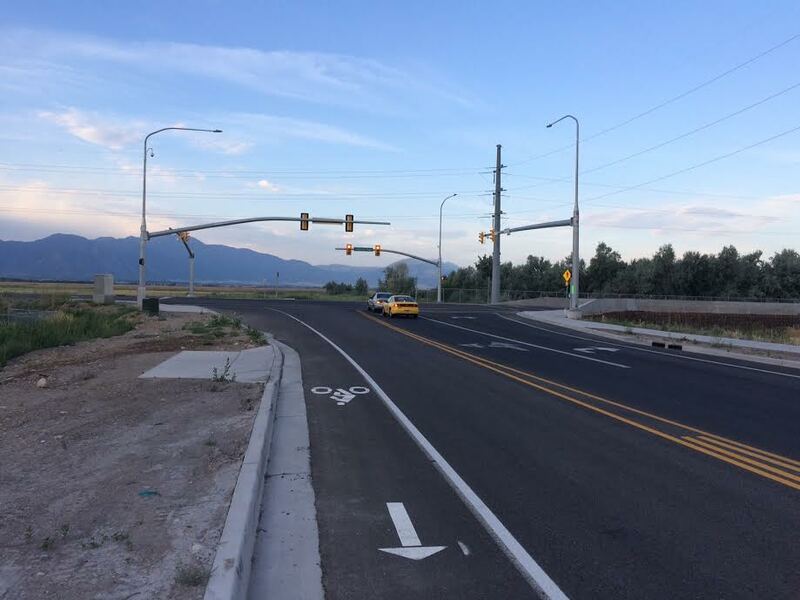 In short, the 500 West lanes are a significant step toward the creation of a robust network of bikeways in Provo and a boost to quality of life. The lanes at their southern edge at the Lakeview Parkway. The trail runs on the south side. Becky Hunt, a resident of Lakewood Neighborhood who uses 500 West to get her job at city hall, said “I love the new bike lanes. 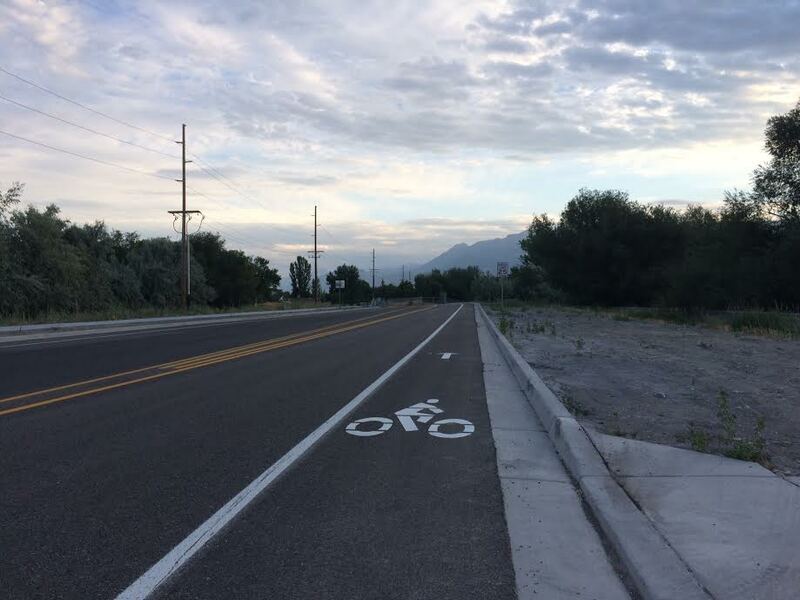 My commute to work is much safer.” Curtis Thacker, who commutes from south Provo to BYU and uses it for recreational rides to get to Provo Canyon, commented, “The new bike lanes on south 500 West are great. Before this change there were no lines on the road. Adding bike lanes makes the road much safer for cyclists. These new lines on the road effectively narrow the road through a school zone, naturally slowing traffic through that area. 500 West also provides great access to Lakeside Parkway which is great for cyclists. The changes are an all around great thing. I only wish the bike lane went further north on 500 West.” Another resident of the neighborhood and fellow city employee, Phil Uhl, upon hearing the news that the lanes would be installed exclaimed on Facebook, “My commute (4x per day on this segment) just got safer.” He must go home for lunch. The lanes looking running north from the 1-15 underpass. Bike commuters headed to work in the opposite direction at companies in East Bay are happy about the lanes too. A resident of the Dixon Neighborhood who had just started a new job in that area and was unfamiliar with 500 West without bike lanes said that he was sure glad they had been installed. He could not imagine riding safely on the road without them. Brandon Taylor, who lives in Grandview North Neighborhood and works in the old Novell building, said “the new lanes are pretty cool. 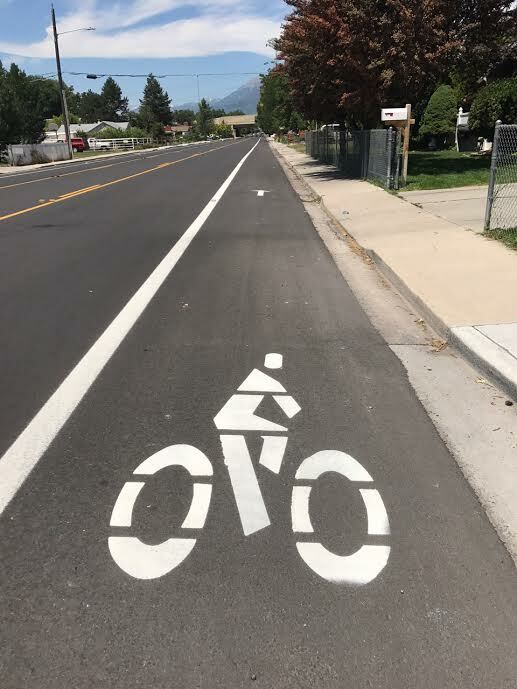 They are very obvious as opposed to most bike lanes that can easily be looked over.” Perhaps it is the newly painted lines on a road that was completely devoid of any lines before. Looking south at the lane just north of the train tracks. 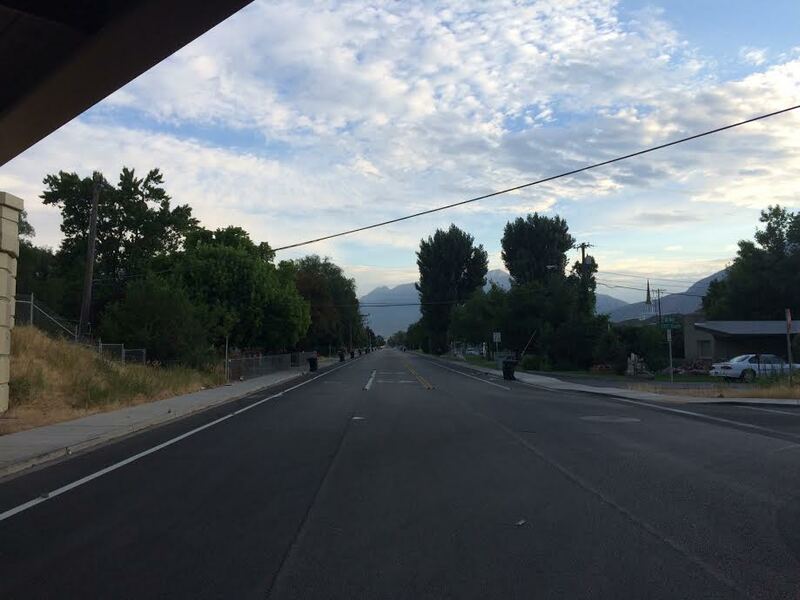 In the near future, the new lanes on 500 West will connect to the wider network of lanes that is emerging in Provo. 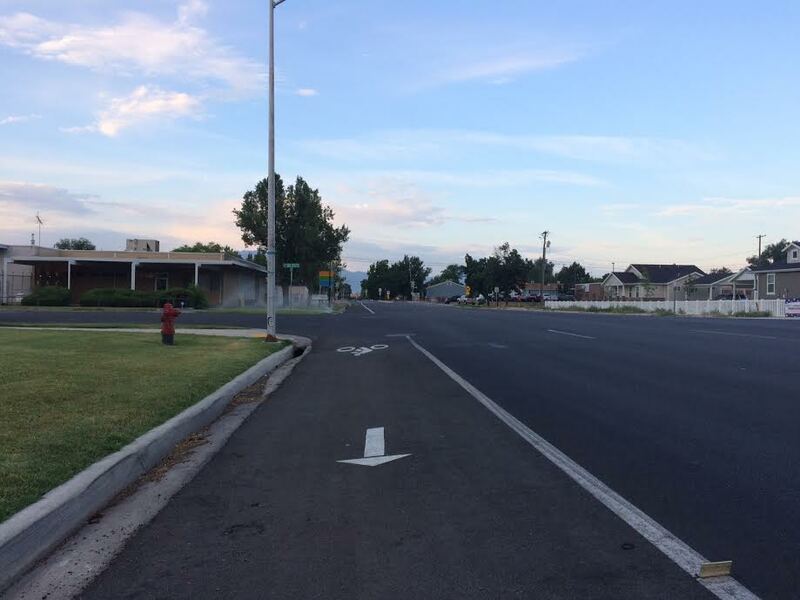 UDOT has indicated that next year they will be installing bike lanes on the part of 500 West that they control: State Street. Although they have not revealed their final plans, those lanes will likely run north from 300 South to Bulldog Boulevard, which will be endowed with protected bike lanes next year. Those two projects will connect people on bikes to the lanes on 500 North (going in this year); those going east and west on 800/820 North; the bike lanes on University Avenue, both those installed by UDOT north of 700 North to the mouth of the Canyon last fall and those that will be installed south of 700 North to 500 South as a part of the BRT project; to the Provo River Trail and College Connector Trail; and so on. The goal is an interconnected web of bikeways (absent of any gaps!) that people of all ages can navigate safely and conveniently making bicycling not an alternative form of transformation, but at least for short trips around town, a safe, convenient, and preferable mode of getting to work, to school, and to run errands. That will greatly improve resident’s quality of life. A bike marker moments after it was painted in the lane on July 6th. Thanks to Mayor Curtis and his Public Works team for understanding that and for their dogged efforts to ensure that bike lanes were installed on 500 West, despite the legitimate demand for on-street parking on the road. It’s now time to officially install bike lanes on another important north-south corridor, one with negligible on-street parking: Canyon Road. Headed north on the new lanes from the Lakeview Parkway Trail.